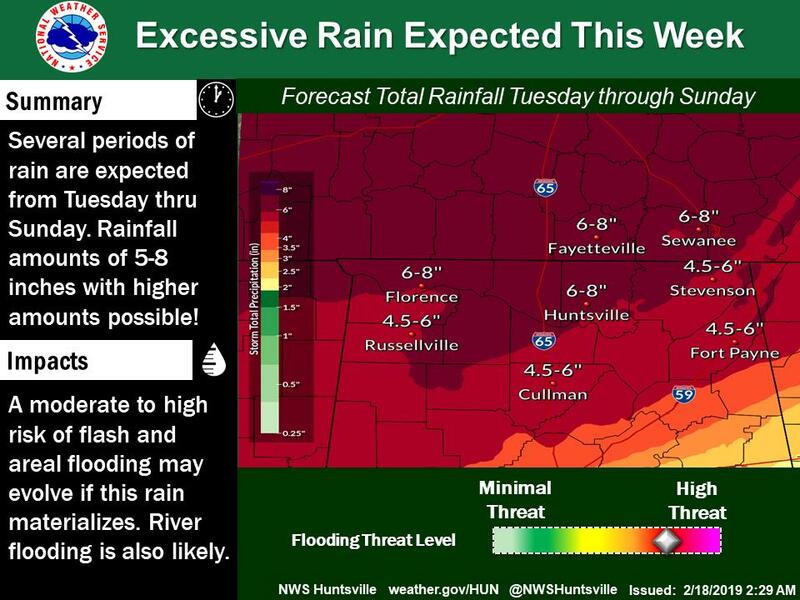 What’s taking so long for a flash flood watch to be issued for north Alabama? Guidance is showing less accumulation and intermittently westward trends so we'll see what happens when the time comes I guess.. It's a bit obnoxious to have model consistency and agreement for a week then things shift gears a couple days out. This has been a MAJOR issue across all model guidance for years now, and its the same thing that causes them to change every time.. 500mb heights are higher than forecast, ridge is more stout, and it forces the system back to the NW and shears it out. I'm beginning to think its an example of climate change at work. The heaviest rainfall wasn't expected until Tuesday and later. Therefore, its best to hold off on a watch for now. You'll see one issued this afternoon or tomorrow morning. Expect 3-6 more inches of rainfall through the weekend. Yeah, I can't believe BMX went with 10-15" on their graphics from yesterday. NWS Huntsville has dropped the estimated totals a little bit. I actually think the bigger threat for heavier rainfall will come tomorrow as the line of broken storms will come to a screeching halt as main dynamics pull north. Looks like Birmingham's all-time record high PWAT will be broken then, so heavy rain will be a problem. Mesoscale models are not initiating well with the mass of heavy rain south of I-20/59. I so didn't expect to see that sleet this morning. Welcome to Alabama. Upper 30's here and thunder! 41, feels like 33, and a thunderstorm here in Columbus. This would be more fun if it were a few degrees cooler. BMX 12z sounding showed a pretty warm airmass riding over surface cold. MUCAPE of 400-500 J/KG shows we have some instability to work with...thus lightning and thunder. 43 and lots of thunder in Anniston! Don't see this scenario very often here. Alabama, Fayette, Lamar, Pickens, and Tuscaloosa. will runoff, filling low lying areas, ditches, and creeks. excessive rainfall locally and across upstream river basins. be ready to take action if water levels rise. and a flood warning is now in effect there. Do not drive cars through flooded areas. Turn Around...Don`t Drown. the Locust Fork At Sayre. * At 7:00 AM Tuesday The stage Was 18.5 feet. flood stage by early Friday afternoon. agricultural lands along the Locust Fork occurs. Moderate rainfall will occur along and north of Interstate 20 today. the Interstate 20 corridor, potentially continuing into Thursday. river flood warnings could be issued in coming days. later updates for portions of the area. Wednesday through Thursday, and again Saturday and Saturday night. It's wonderful to hear the thunder roaring again. Looks like W/Central TN is the place to be if you are interested in getting too much rain. Flash Flood Warning now in effect for Cullman and Morgan Counties in north Alabama. Brad Travis said the models did not pick up on the heavy thunderstorms over the Bankhead Forest. This is an incredible lightning storm for being in the 30s and 40s temperature wise. Wow..
prone areas with poor drainage or near small creeks and streams. Moundville, Berry, Parrish, Coker and Oakman.